China's southern regions faced more heavy rainfall on Monday as a devastating typhoon swept west, a day after wreaking havoc in Hong Kong and Macau and killing potentially more than 50 people in the Philippines. China Meteorological Administration said early on Monday rainfall from the typhoon, dubbed the "King of Storms", was expected to reach 100-160 millimetres (4-6 inches). It said Mangkhut was located in Hengxian in Guangxi at 6 a.m. HK/SIN (2200 GMT Sunday) and had weakened to a "tropical storm." The storm was also due to hit the regions of Guizhou, Chongqing and Yunnan on Monday. Super typhoon Mangkhut, with hurricane-force winds well over 200 kilometres per hour (124 miles/h), had barreled past the northern tip of the Philippines, killing at least 50 people. It then skirted south of Hong Kong and the neighbouring gambling hub of Macau, before making landfall in China. Parts of Hong Kong and Macau were severely flooded, though there were no immediate reports of any fatalities. Two people were reported killed in Guangdong, China's most populous province and home to over 100 million residents, state media reported. The China Meteorological Administration said the typhoon, dubbed "King of Storms", swept west to Guangxi province at 6 a.m. (2200 GMT on Sunday) and weakened to a "tropical storm". It forecast the storm to hit the regions of Guizhou, Chongqing and Yunnan on Monday. 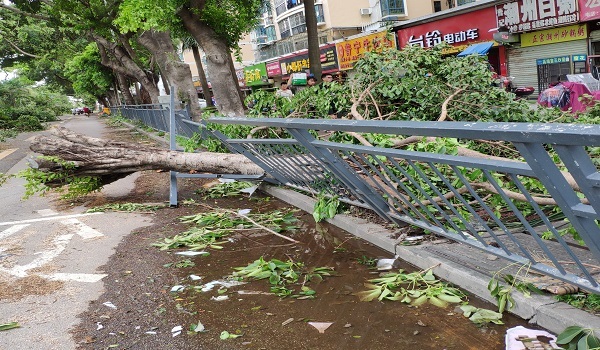 Across Hong Kong, authorities strived to clear roads of debris, including toppled trees and bamboo scaffolding. Some buildings, including the One Harbourfront office tower, had many windows smashed after a day in which some of the city's skyscrapers had swayed with the ferocious gusts. "Yesterday's storm was very strong. Even for a person of my weight, I was about to be blown down by the wind which made me very scared," said a 70-year-old resident surnamed Fung. "It was very serious this time."